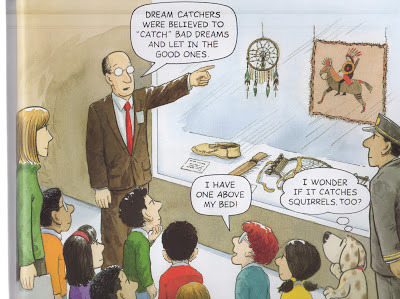 Debbie Reese explores another children's book in her American Indians in Children's Literature blog. In Bailey at the Museum, the titular dog "tags along on a school field trip to a natural history museum." This museum is modeled on the Museum of Natural History in New York City. Nothing on the page tells us what tribe this page is about. Notice the use of "were" instead of "are" in the information the museum guide says? I can imagine a museum guide saying "were" instead of "are." If Bliss heard a guide say that, he did not have to repeat that error. He could have used present tense instead, don't you think? There is a teepee on the next page. All we see of Bailey is his tail sticking out the door of the teepee. As with the totem pole and the dream catcher, Bliss doesn't tell us anything about the tribe this tipi originated from. As the field trip draws to a close, the security guard gives Bailey a gift that turns out to be a dreamcatcher and an information sheet "About your Dream Catcher" that says "The Sioux belie" (the rest of the words are hidden by Bailey's leg. Finally! Something tribally specific! Part of me wishes Bliss had included tribally specific information on each page... Would it have interrupted his story to insert just another word or two on those pages to tell his readers who these items originate with? But even if he did include that tribally specific information, he's just using Native cultures as decorations and props for his story about Bailey. Some find the story amusing. I find it insensitive, and, it also negates what museums are trying to do with their exhibits. As such, I do not recommend Bailey at the Museum.Comment: Reese doesn't note what may be the worst problem: that the book includes Indians with cavemen and dinosaurs. Indeed, it sounds like something of a straight-line progression: from dinosaurs to cavemen to Indians. Perhaps some exhibits on civilization follow those on the "savages." Or perhaps the museum switches to other "natural" topics such as astronomy, geology, and meteorology. Some museums still juxtapose Indians with nature, not humanity, but some don't. Bliss could've taken a more progressive approach, but didn't. That alone is enough to disqualify the book for discerning readers. For more on Indians in children's literature, see Stereotypes in Tiger Lily and Funny Indian Names in Soonchild. Blatant plug: check out William Walker "We Don't Live Like That Anymore: Native Peoples At The Smithsonian's Festival Of American Folklife, 1970-1976" AIQ, Fall 2011.